胡德鑫. 中德顶尖研究型大学研究生国际化能力比较研究——以清华大学和柏林自由大学为例[J]. 研究生教育研究, 2017(6): 83–89. 包海芹, 孙晓园. 共词分析视角下的研究生教育研究热点和主题分析[J]. 学位与研究生教育, 2017(8): 54–60. 王传毅, 吕晓泓, 李明磊. 中国研究生教育领域学者合作的实证研究:基于作者共现的社会网络分析[J]. 学位与研究生教育, 2017(8): 61–66. 胡德鑫. 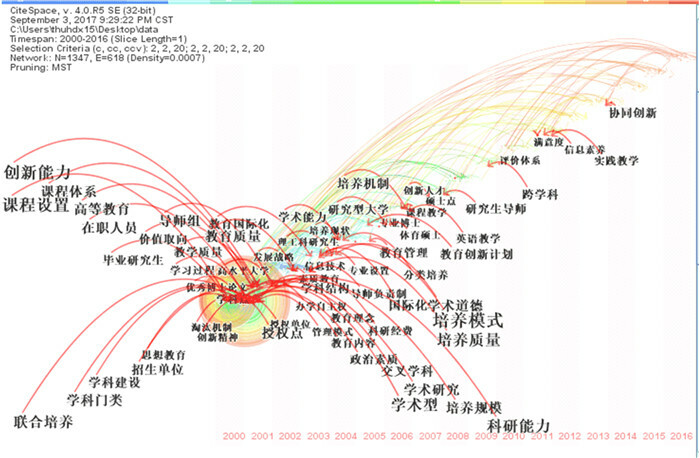 我国高等工程教育研究的热点领域与前沿——基于CNKI 2007-2016年文献的计量和可视化分析[J]. 中国人民大学教育学刊, 2017(3): 78–92. 邱均平, 马瑞敏. 基于CSSCI的图书馆、情报与档案管理一级学科文献计量评价研究[J]. 中国图书馆学报, 2006(1): 24–29. 侯剑华, 陈悦, 王贤文. 基于信息可视化的组织行为领域前沿演进分析[J]. 情报学报, 2009, 28(3): 422–430. 陈钟颀. 我国学位与研究生教育的特色[J]. 学位与研究生教育, 2012(4): 4–6. 罗英姿, 方超. 我国研究生教育制度变迁的审视与反思-一个新制度经济学的分析框架[J]. 江苏高教, 2016(3): 100–104. 周文辉, 黄欢, 付鸿飞, 等. 2016年我国研究生满意度调查[J]. 学位与研究生教育, 2016(11): 60–66. 张天舒, 杜言敏. 硕士毕业生求职行为与就业结果关系分析[J]. 学位与研究生教育, 2012(5): 34–38. 古继宝, 吴蔚, 彭莉君. 职业目标对工程硕士研究生实习效果及就业能力的影响[J]. 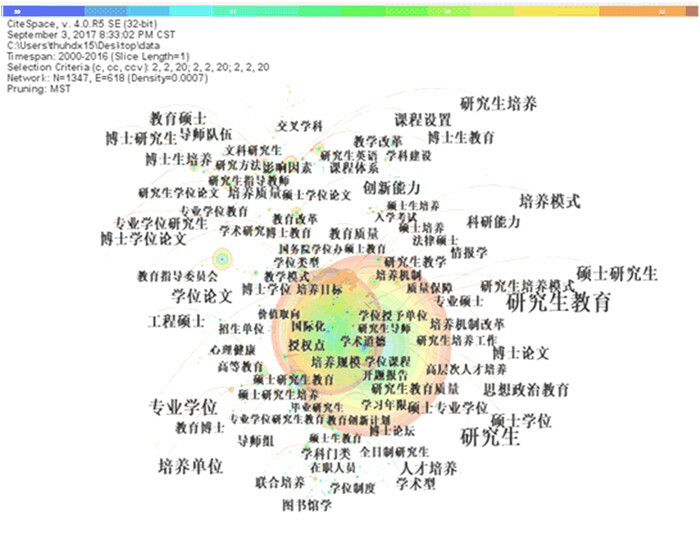 学位与研究生教育, 2016(7): 57–61. 谢维和. 谈学科的道理[J]. 中国大学教学, 2012(7): 4–6. 张德祥. 高校一流学科建设的关系审视[J]. 教育研究, 2016(8): 33–39, 46. 张金福, 吴倩. 政府管理"碎片化"对大学学科建设的影响及其治理[J]. 中国高教研究, 2012(7): 30–34. 别敦荣, 易梦春, 李家新. "十三五"时期研究生教育发展思路[J]. 中国高教研究, 2016(1): 83–90. 陈桂生. 导师与研究生关系的事态述评[J]. 江苏大学学报(高教研究版), 2004(3): 43–45. 白清平, 陈巧玲. 我国研究生思想政治教育:问题及对策[J]. 研究生教育研究, 2012(5): 16–19. 史秋衡, 陈志伟. 德国双元制应用型硕士培养机制探究[J]. 国家教育行政学院学报, 2016(4): 3–11. 王传毅, 严会芬, 吕晓泓. 跨学科研究生培养:加拿大大学的实践与特色[J]. 研究生教育研究, 2016(5): 84–89. 中国学位与研究生教育学会进展报告编写组. 中国研究生教育研究进展报告(2017)[M]. 北京: 中国科学技术出版社, 2017: 42. Abstract: With 7, 484 CSSCI source journal papers on postgraduate education published since the beginning of the new century in the CNKI as the objects, the authors, with bibliometrical approaches, systematically analyzes the status quo of the study from three dimensions of the distribution of the papers in major periodicals, core research institutes, and key researchers. In addition, the authors also analyze, with visualization approaches on the map of scientific knowledge, the hot research topics and the changes of the topics on postgraduate education. After the analysis, the authors find that the hot topics drawing sustained attention are basic issues related to postgraduate education, education quality, personnel training, enrollment and employment, and postgraduate education management. The research hot topics that drew close attention of scholars at different times in the past 17 years are the construction of the supervising team, ideological and moral education, discipline construction, and comparison with other countries.